Voted one of the prettiest rails-to-trails in the US, the Wabash Trace Nature Trail is Iowa's longest. It travels from Council Bluffs to the Missouri border for a total of 63 miles. There are over 70 bridges to cross and 7 towns to visit along the way. 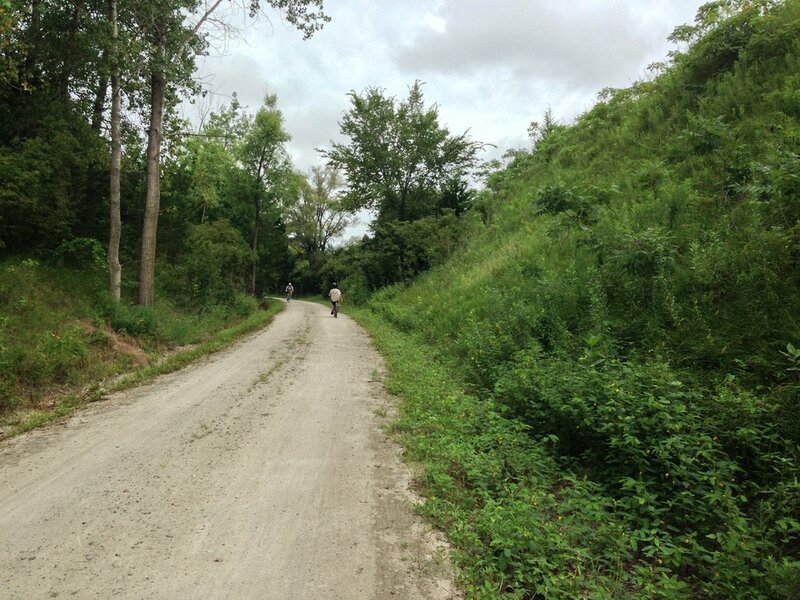 The Wabash Trace has gotten plenty of press with it's appearance on Bike People TV, acknowledgment from Outside Magazine, and a member of Rails-To-Trails Conservancy's Hall of Fame. There are websites dedicated to the trail along with a Facebook page. The trail was also the location of this year's Peddler's Jamboree and is a Thursday evening hot spot for the local Taco Ride to Tobey Jack’s. The trailhead in Council Bluffs has ample parking, a picnic shelter, playground and portable restrooms. Then there's the dense tree canopy and the Loess Hills, both beautiful features. A $1.00 daily pass is a recommended for those over 12 and under 64 years old. Yellow trail pass drop boxes can be found at trailheads. Money goes towards trail maintenance. It's been an embarrassing amount of time since I declared the Wabash being a trail I was going to ride. Two years later it finally happened! With plans for a bike ride followed by an afternoon in Omaha, our family headed west. We took along mountain bikes for the unpaved trail. The limestone surface turned out to be in great shape and skinny tire friendly. The morning was a busy one with lots of folks out for a run or a ride. We stopped for a short break at what's known as Margaritaville and then had a breakfast snack at the trailhead in Mineola. It was cool to find a Little Free Library there! Pedaling along on the flat trail I would get a peek at what appeared to be a mountain bike trail winding up over bluffs and through timber. Then I remembered it was an equestrian trail. Boy do they have a tougher way to go! There were so many shade of green! The Wabash Trace would be a fantastic trail for seeing fall colors too. Perhaps I should plan on doing just that...and not wait two years to do it.